For more information on the critical path see Show the critical path. On the Edit tab, in the Settings group, click Scheduling Settings. 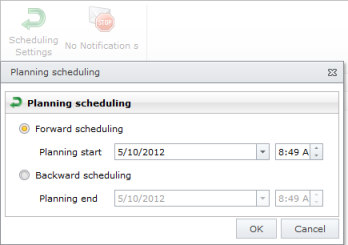 In the Planning Scheduling dialog box select Backward scheduling. Enter an end date for the planning. Choose the date in the Planning end box. InLoox PM Web App calculates the project plan from the end date until the start date. How to plan projects with backward scheduling | InLoox PM 7 Web App • Copyright 1999-2019 © InLoox GmbH. Reservados todos los derechos.